Practical tips on how to write great marketing content. This book is not just for writers. It’s for marketing managers, business owners, artists, engineers, volunteer organizers – anyone who wants to market their business or mission. If you’re tasked with writing content and need help, I’ll show you how to make the process easier. 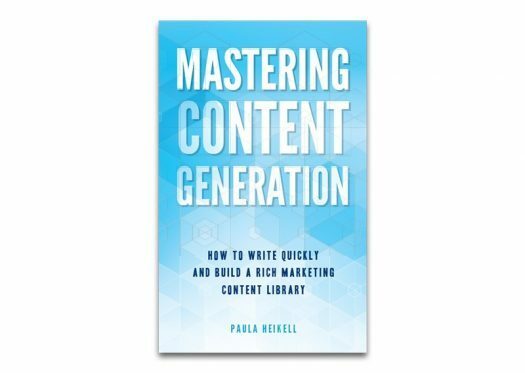 My book, Mastering Content Generation, is designed to help you create high-quality blog posts, web pages, white papers and more on an ongoing basis, in the most efficient manner possible. If you’re new to writing, you’ll find practical tips to help you get started. If you’re responsible for coming up with topics, I’ll show you how and where to look for ideas. If you’re the keeper of the content schedule, I’ll show you some easy ways to keep your calendar full. I’ve organized the book into easily digestible chapters with a clear focus and plan for every step of the process, from idea generation, to writing and editing tips, to building an ongoing content calendar. I’ve also included many examples, templates and other tools to help you create a plan tailored for your specific audience. Try a few of my suggestions and see if they make content writing go a little more smoothly for you. I know they’ve helped many of my clients improve the quality of their content and increase the effectiveness of their marketing programs. Thank you in advance for your interest. Any and all feedback is welcome! For only 130 pages or so, this is a comprehensive text, and an easily understandable guide to writing, research and marketing a product, company or platform. Its applications are many and you may want to consider providing a copy to writing and business departments of colleges and universities, since it truly would be beneficial in an academic setting, especially given the encouraging tone. It can be read and reread as reference material. I think it would be a great read for a political science student as well. Congratulations on a job very well done Paula! Thank you for reading the book! I appreciate your suggestions!